Solo work gets online release. The Beatles to follow? Paul McCartney's solo and Wings years are going online soon. Could The Beatles be next? "EMI Music and MPL confirm the release of the entire Paul McCartney solo catalogue digitally for the first time ever. 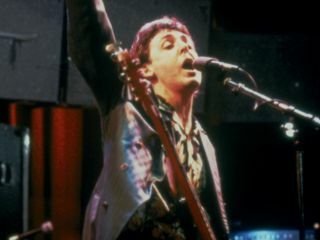 "EMI Music has retained Paul McCartney's solo catalogue and is preparing a comprehensive re-launch, including new digital campaigns as well as physical re-releases. This means that, for the very first time, McCartney and Wings albums will be made available across all digital platforms - more details to be announced shortly. "This amazing catalogue stretches from Paul's first solo album McCartney through his releases with Wings to his latest critically-acclaimed studio album Chaos And Creation In The Backyard. Within these albums lies a breathtaking list of singles including Band On The Run, My Love, Let 'Em In, and Jet." The news is sure to throw fans of The Beatles into a frenzy and this clearly opens the door to a release of the Fab Four's catalogue online. It's also something that Apple CEO Steve Jobs has long been waiting for - he said Apple would do "whatever we can" to get The Beatles on to iTunes. Apple (the computer company) and Apple Corps (The Beatles' company) kissed and made up in February following years of rancour and lawsuits between the two. Steve Jobs dropped heavy hints about a possible deal during the Apple iPhone launch in January. His presentation made frequent references to The Beatles. And they even placed music from and the artwork to The Sgt Pepper's Lonely Hearts Club Band album. This all dovetails nicely with EMI's move into DRM-free music . EMI announced a tie-in with Apple in March and also has the distribution rights to much of the Beatles' musical output. EMI has already begun making DRM-free content available online including the first album from The Good, The Bad and The Queen . Paul McCartney releases his next studio album Memory Almost Full on Monday 4th June 2007.